Guy Walks Into A Denny's, Cooks A Burger, Gets Arrested : The Two-Way And for his alleged crime, James Summers of Madison, Wis., gets written up in one of the funniest police reports ever. This alleged crime in Madison, Wis., is odd enough — or funny enough, depending on your point of view — to begin with. 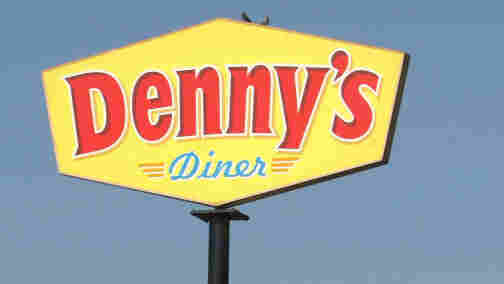 It seems that 52-year-old James B. Summers went into a local Denny's restaurant Tuesday afternoon and said he was the new general manager. This was a surprise to the folks working there. Summers, though, insisted that he was indeed the new boss. And he seemed to be familiar with the kitchen — he grabbed a soft drink and cooked up a cheeseburger and fries. You've probably figured out where this story's going. It's got shades of Seinfeld's George Costanza. Summers is under arrest. He's been charged with fraud, disorderly conduct, possession of an electronic weapon and possession of drug paraphernalia. "He never announced he was one of the pros from Dover, but the briefcase toting gentleman wearing a maroon tie and long black trench coat was quite clear: he had been sent by corporate. He claimed he was the new general manager, that he had worked for the restaurant chain for 30-years and was starting his new job - right now. "The gray haired stranger with the goatee had just arrived yesterday afternoon, unannounced, at the private office door of the restaurant manager. She was in the process of counting the day's receipts at the Denny's on Thierer Rd. "Surprised, and a bit shocked, the 38-year old thought, surely, this must be a mistake. She had heard nothing from corporate about a new general manager, and politely told the man so. Perhaps, she indicated to him, you have arrived at the wrong restaurant. This conversation developed into a tête-à-tête or a 'nose to nose,' to quote the manager, as the man asserted his new role as she told him she thought not. "This went on until he said it was final, he was going to commence his duties. It was at this point, the manager began making calls up-the-chain. She was able to reach the man in charge of all hiring at her location. By this time the new 'GM' had left the office, but not the restaurant, and she had shut the office door in order to carry out this important, private conversation. "While on the phone, she waved off kitchen staff as they rapped on her door, trying to get her attention. She was not to be interrupted while talking with corporate. What cook staff wanted her to know was that the new 'GM' was in the process of cooking himself up a cheeseburger and fries, and that he had gotten himself a soda. "He was in the midst of dining when she let him know the gig was up, that she had talked with corporate, and he was no new hire. Unfazed, he continued to brush off her remarks, saying she just had not yet gotten the memo. "It was about this time the manager called 911. When the responding officer arrived, he saw the suspect walking away from the restaurant. Upon contact, he told the officer there had been a great misunderstanding, that he was the new GM, but there must have been a paperwork goof-up. He agreed to respond back to the restaurant so both sides could present their case. "The manager prevailed and the man was arrested. The officer found, beneath the trench coat, and a suit jacket, that he was packing a stun gun on his belt. The officer asked the suspect if he had a concealed carry permit. The man replied, 'It's in the pipeline.' He was cooperative with the officer, but as he was about to be led from the restaurant, he yelled out to those eating: 'This is why you don't dine and dash kiddies.' "
DeSpain, by the way, tells that this tale just seemed to deserve a lighter telling. "Once in a while, people need to enjoy a laugh," he said this afternoon after we reached him by phone. Update at 2:15 p.m. ET, Feb. 24. How Could We Have Forgotten Beezow Doo-Doo Zopittybop-Bop-Bop? Jim Romenesko's blog post reminds us that the Madison police department was also responsible for telling the nation about Beezow Doo-Doo Zopittybop-Bop-Bop. The "incident report" about that alleged criminal, however, isn't as whimsical as the one DeSpain did about Summers.